A blast from the past: This is the photo Jörg took of Jeffrey two days ago, just north of Yulee, FL. Nancy commanded Jeffrey to wear that thing around his neck, bearing Nancy’s contact info, in case the houn’ dawgs drag him off. Eager to please his one true love, Jeffrey hastened to obey. Once again, we left before sunup. We crossed a high bridge and rolled through dark countryside. 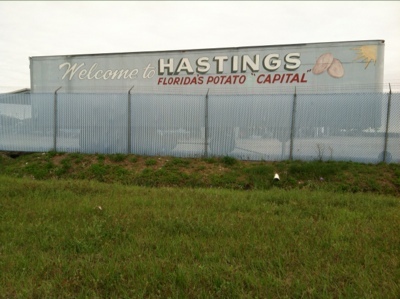 Daylight found us in Florida’s potato capital. We didn’t know it had one! 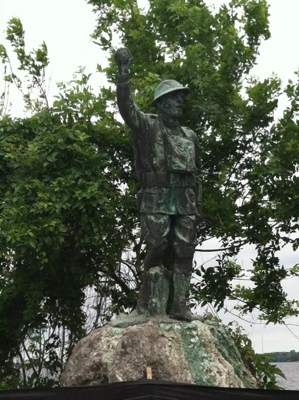 This battered doughboy is at the approach to the bridge to Palatka. 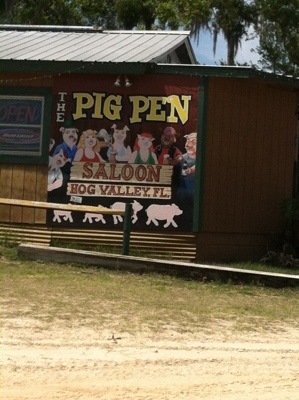 Palatka is a charming town. 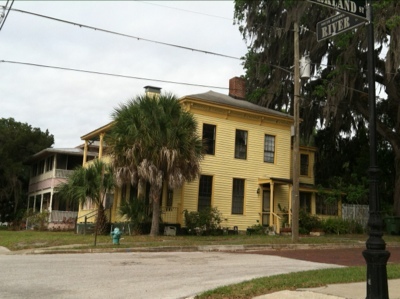 Magnificently porched Victorian houses line historic River Street. Florida’s cities and political extremes get a lot of attention. These places, less known by the Disney-bound crowd, are a different world. 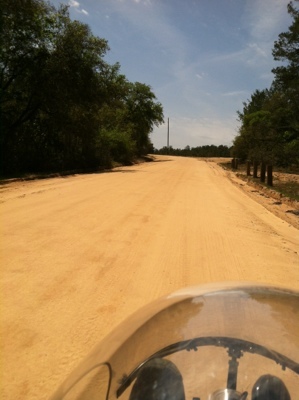 Soon we turned onto a Forest Service road into the Ocala National Forest. 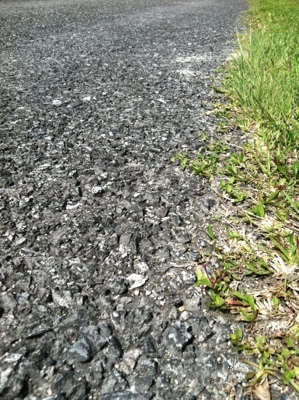 The first five miles was gravel in an asphalt matrix. Paved, yes. But look how rough! The rolling resistance was very high. 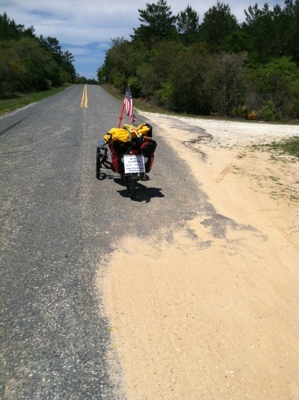 The same effort that kept the trike at 7 mph would propel us at 14-16 mph on smooth pavement. We passed the Rodman Reservoir, created by the Kirkpatrick Dam on the Ocklawaha River. 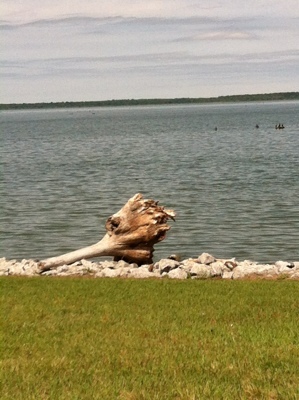 Note the tree trunk “driftwood” resembling a dinosaur thigh. A bit beyond the dam, which was crowded with anglers, we came to a parking lot where Bret Bush, a Forest Service program manager, approached Jeffrey. Bret told him this was the end of the paved road. Beyond us was sand better suited to all-terrain vehicles, or perhaps (said Bret) mountain bikes. He questioned whether the trike could get through. Jeffrey was not willing to retrace our 5-mile, tiring, bone-rattling route over that rough pavement. He and Bret checked a map, and Bret showed him how we could detour a bit and reach pavement after only 2-1/2 miles. Bret told him the next place to find water was a general store 9 miles away. We had 2 quarts (liters) on board, enough for camel Jeffrey to chance it. Turns out the trike did well in the sand. It has 1.6″ (4 cm) tires – fairly wide – and its weight is spread among 3 tires, so it didn’t sink as much as a bike would. It’s not prone to tip, so Jeffrey could pedal furiously and remain upright. 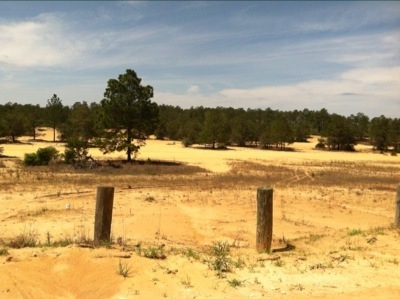 Much of the road was packed harder than the sand tracks we encountered in South Carolina. We were able to ride for all but the last 200 yards (meters) or so, until we reached pavement. 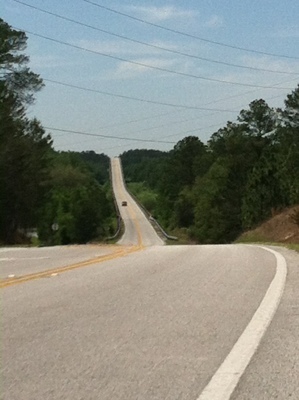 We climbed some hills, to a stretch with a few houses and trailers. Then, a cheery call: “Would you like a drink?” Wow! Would we ever! 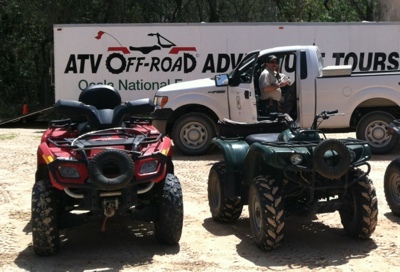 Sandy and Larry had passed us in their 4×4 while we were negotiating the sand road in our 1×3. They had read our Ride for Human Rights sign and were expecting us. 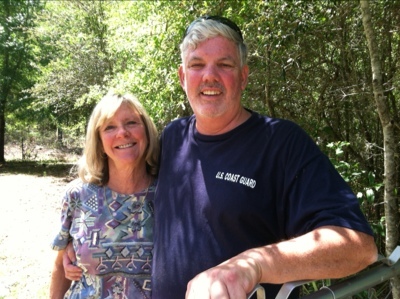 Larry is a Coast Guard veteran, originally from Long Island. Sandy is from the South. 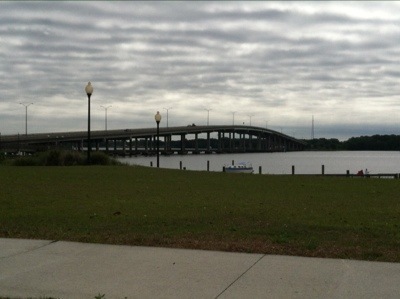 Both work for the Jacksonville, FL, municipal government, and come to Hog Valley (that’s what it’s called!) on weekends. 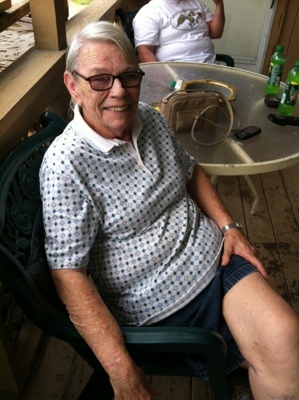 Their two sons are in the Coast Guard – a family thing, Larry says. Jeffrey explained HRF’s mission and told them a little about the bewilderment of asylum seekers who have no lawyer, and about the immigration detention system. Sandy and Larry know law enforcement and code enforcement, and they recognize when a system is broken. Two big icy cups of pink lemonade and some friendly conversation later, we were back on the road. 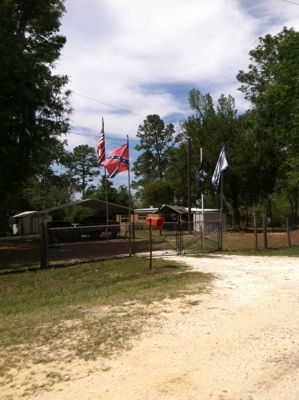 Hog Valley people display a lot of Confederate flags. After this one, we’ll stop showing them to you. Several of the men on the porch gave Jeffrey valuable route advice. “Turn at the big oak tree.” (We did. It worked!) The man on the left, whom we’ll call McGill (the name on his cap; he jokingly declined to give his real name, saying he is wanted in 4 states), asked to shake Jeffrey’s hand when he heard we had pedaled from NYC. Jeffrey talked about HRF and asylum seekers. McGill nodded when he heard about free counsel for refugees. He knows a man who sought asylum from Laos and had needed a lawyer’s help. Another honorary member of our team! Fortified with water, sugar, advice and warm wishes, we continued south, crossed a narrow-shouldered high bridge, and left the National Forest area. Now we’re closer to the Gulf of Mexico than to the Atlantic. 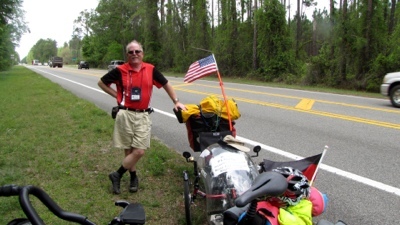 This entry was posted in Asylum, Bicycle Touring, Confederate flag, Human Rights, Immigration, Tricycle touring by Joey. Bookmark the permalink. 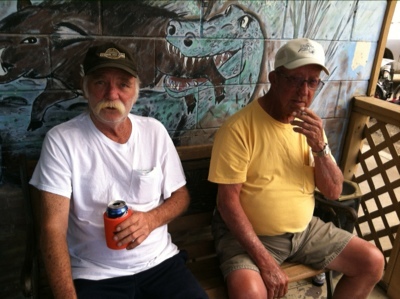 One wonders if after several days among the rustic landscape and rustic, unpretentious citizenry, how you will adjust to the likes of St. Petersburg or other “retired/snow bird” communities among the more developed Gulf Coastal areas you will probably reach sooner than later. It’s good you seem to have had good ( that is relatively dry) biking weather for so many of your days….I guess the heat is on now in April in Florida. Yes, unpretentious. Well put! Smart & sophisticated too, in their world. And good natured. And sympathetic to refugees faced with a daunting bureaucracy. We feel welcome everywhere.